Instead of smoothing over contemporary art's violent and iconoclastic dimensions, instead of sanitizing and making complex artworks docile in terms of archival possibilities, this book suggests we abandon our fantasy of mastery over representation and respond in kind to the archive-as-artwork, to "living" archives, and to reenactments of history with their seamless connections between fiction and non-fiction. Among the concepts examined are Vilém Flusser's techno-imagination, Lygia Clark's and Hélio Oiticica's participatory aesthetics, and Paulo Bruscky's and Eduardo Kac's literal performances of the archive. They contribute to the erosion of the archive's former boundaries, stability, function, and meaning. 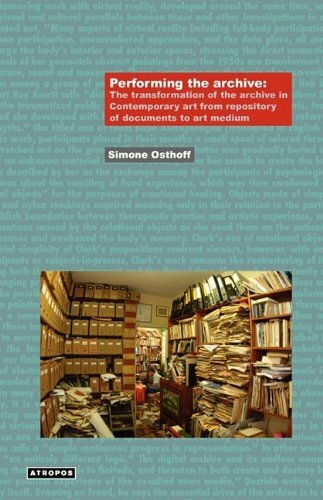 Writing alongside the artists as much as about them, Osthoff examines the archive mise-en-abyme, as it grows increasingly recombinant and generative. Simone Osthoff received her Ph.D. from the European Graduate School and is Associate Professor of Critical Studies in the School of Visual Arts at Pennsylvania State University. An art critic and historian of contemporary art, her numerous essays, focusing on media art practices and issues of historiography, have been published internationally and translated into over eight languages.